Stay comfortable all day with these ergonomic, fully adjustable office chairs. If your goal is to find a chair that offers the best value, consider the Alera Elusion Series. The chair scores well in four big areas: it’s comfortable, adjustable, attractive, and well-priced. Plus, it comes in 25 different color options. The chair’s ergonomic design is completely customizable, which makes this chair a great choice for a family home office shared by more than one person. Change the seat depth, height, tilt, and the arms to find your perfect fit. A breathable mesh back, a contoured seat cushion, and a waterfall edge add to the chair’s comfort. Users say this office chair is easy to assemble, comfortable, supportive, and durable. Some users even claim it eliminated daily pain and showed no signs of wear and tear after more than a year of daily use. If you’re outfitting an office that’s seldom used or simply want a basic office chair, the AmazonBasics is a good bet. Despite the desirable price tag, it features an ergonomic design and is fully adjustable to suit a wide range of individuals. Simple controls allow you to customize seat height and tilt. The simple design blends seamlessly into both corporate and home office environments seamlessly. 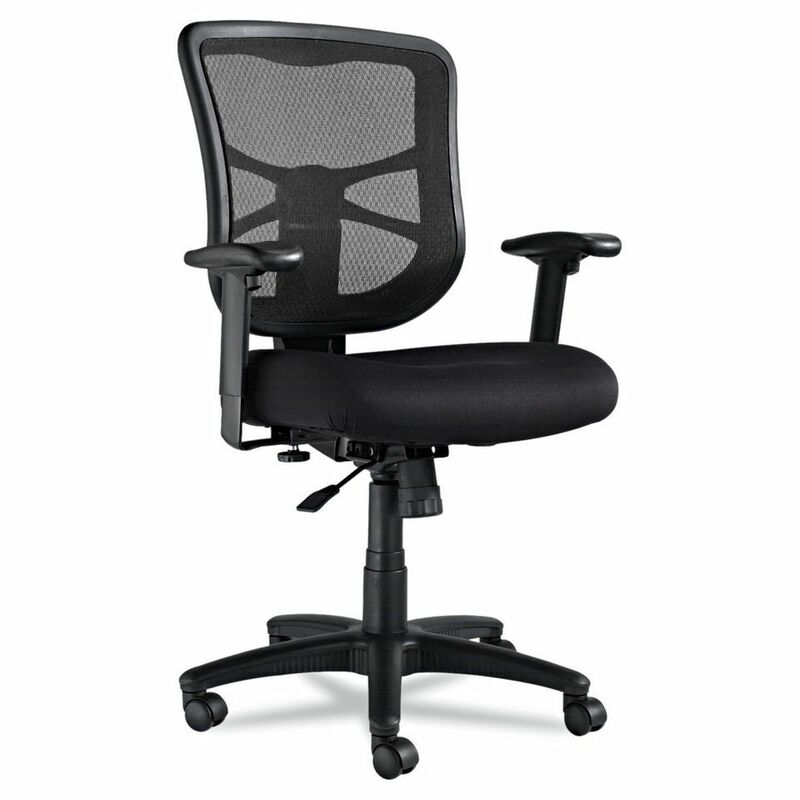 Plus, the mesh backing on the chair helps promote air flow to keep you cool and comfortable throughout the day. Nearly 2,000 users give this office chair five stars, noting what a great pick it is given the price point. They say the chair offers plenty of lumbar support and is very comfortable to sit in for long periods of time. If aesthetic is your main concern, you don’t have to sacrifice function for form. Though this office chair doesn’t offer all of the same bells and whistles as the ergonomic office chairs on this list, it is comfortable enough to spend many hours in. It features an adjustable height, so you can sit properly with your feet square on the floor, whether you’re short or tall. Another bonus is that the cushioned swooped seat gently cradles the body. Reviewers love the style of the chair, especially its retro vibe. They also note that the chair is comfortable but compact enough for small spaces like apartments. If there’s any downside, it’s that the wood is a bit darker than it appears in pictures. If formality is key, a leather office chair is your best bet. The Alera chair is a great option, because its cushions have a slim profile that offers a distinctly modern—and definitely not stuffy—vibe. And while this leather office chair looks sophisticated, there’s more to it than meets the eye. This particular pick features an ergonomic design that offers just as much comfort as other more utilitarian options. It has a waterfall seat that reduces pressure on the back of the knees to help improve circulation, as well as padded arm caps. More than 350 reviewers give this office chair an enthusiastic five stars, citing comfort as the main selling point. It’s not too firm nor too soft, they say. Users also appreciate the value, saying the chair looks much more expensive than it is. If comfort is your main concern, give this office chair by AmazonBasics a try. The executive-style chair has comfortable padded seats that are covered with supple bonded black leather. A gently contoured padded back and textured nylon armrests help align the body and provide additional support. To find your perfect posture, simply use the pneumatic controls to adjust the arm height, the seat tilt, and the tension. More than 2,500 happy reviewers say this office chair is a great choice, especially given the price tag. They say it strikes the right balance between comfort and utility, though some do point out that this office chair might not be quite right if you plan to use the chair all day every day. If you regularly experience back pain, back support should be the most important consideration when buying an office chair. Look for a high-quality office chair, like this one by Herman Miller, that offers lumbar support, contouring, and some cushioning. These features not only help you maintain good posture, but also alleviate pressure on your lower back. A good office chair is also an adjustable one. To ensure you can find the right support for your own body, look for a chair that has an adjustable height, back support angle, and armrests. Other adjustable features, like the angle of the headrest, are also helpful. Though this particular chair is pricey, it’s backed by a 12-year warranty that’ll help you feel better about making the investment. If you have a tendency to slouch throughout the day or experience any type of pain while sitting, a fully adjustable ergonomic office chair is your best bet. Since there is no one size fits all when it comes to office chairs, the only way to ensure proper posture is to customize your chair for your body. The Modway chair allows you to do just that—it features height adjustable armrests, a one-touch chair height adjustment, a seat depth adjustment, a 360 degree swivel, and a tilt and lock system. On top of that, the breathable mesh backing offers passive lumbar support, while a six-inch seat cushion offers plenty of padding. As a bonus, this modern office chair comes in seven different colors, from plain black or white to the more bold green or red. If you have a standing desk, you may not think you need a chair. Although having the option to stand is great for both your physical and mental health, experts recommend alternating between standing and sitting. The Learniture Adjustable-Height Active Learning Stool allows you to do just that, without rearranging your entire setup. The height of the stool is adjustable, so a wide range of individuals can perch comfortably, and a non-slip padded seat ensures you won’t be constantly readjusting. Plus, a backless design keeps your core muscles engaged while you work to encourage proper posture, even while sitting. More than 130 reviewers give this unique office chair five stars, citing comfort and ease of use as the two biggest selling points. We bought three top-rated office chairs and our reviewers tested them for 39 hours. We asked our testers to consider the most important features when using these office chairs, from their adjustability to their lumbar support. We've outlined the major points here so that you, too, know what to look for when shopping. Adjustability While the most basic office chairs aren’t likely to offer much more than height adjustment, more comfort-minded models will give you a variety of adjustment options. For instance, some will let you change the height and width of armrests, as well the tilt position and tension (to control the rock and incline of the chair). Lumbar support Reduce strain on your lower back by picking a chair with lumbar support. Some chairs are ergonomically designed to provide this support for most body types, while others even offer adjustable seat back positioning and width to better accommodate the curve of your spine. If you spend an extensive amount of time in your office chair or struggle with lower back pain, it may be wise to invest in one with adjustable lumbar support to get the best possible fit and feel. Upholstery material Office chairs are often upholstered in leather (or bonded leather), mesh, fabric, or some combination of the three. Leather offers the most luxurious feel but isn’t as breathable as chairs with mesh upholstery. The open weave of mesh-backed chairs allows for greater ventilation, though it often lacks padding. Chairs with fabric upholstery offer the most in terms of color and pattern options but are the most susceptible to stains. “I feel like the chair gave really good back support,” reported one or our testers. “The chair that this one is replacing would give me back pain after less than an hour of sitting — but with this product, I was able to sit without back pain for the entire day.” Our reviewers also thought this chair was very easy to assemble and adjust, as well as comfortable. One thing our testers wished it had, though, was a headrest — or “at least a way that a headrest could be added without much difficulty,” explained one reviewer. The best features of this chair, according to our testers, were its adjustable height and sturdiness. One reviewer also thought it was quite comfortable: “I was pleasantly surprised, especially for the price — the seat cushion is very comfortable and the mesh back offers increased airflow and enough support without the excessive rigidness you sometimes find with more expensive brands.” On the other hand, our testers wished that the chair’s arms were adjustable and also thought that its armrests could use more cushioning.